We’d love your help. Let us know what’s wrong with this preview of Complexification by John L. Casti. To ask other readers questions about Complexification, please sign up. The book's theme is Complex system. Complex systems is the natural sciences , it has been studied mathematics , in various fields such as social sciences. The complex system , very sensitive system , multiple paths that can be the number of independent configuration factors that interact with each other is changing the very large system , or the system for the deployment initial conditions and a slight perturbation it is that of a such system . the author works on Santa Fe Institute、SFI and studie The book's theme is Complex system. the author works on Santa Fe Institute、SFI and studies for complex system. complex system contains various science, Logic and mathematics. you will get various harvests from the book a lot. this year II regarded it as a key book and then I am going to read any books relating with the book. It was a great experience for me to read it. Esta es otra de mis armas secretas. Tal vez no debería recomendarlo, porque sigo pensando que es un libro que de alguna tramposa manera me ha puesto en ventaja ante los demás (definitivamente no ante todos los demás, pero sí ante una fracción respetable). Este libro expone de una manera bastante gráfica y no tan matemática o abstracta las razones por las cuales no parece que la ciencia pueda explicar el mundo y librarnos de todas sus paradojas. De todas formas para disfrutarlo más es preferible s Esta es otra de mis armas secretas. Tal vez no debería recomendarlo, porque sigo pensando que es un libro que de alguna tramposa manera me ha puesto en ventaja ante los demás (definitivamente no ante todos los demás, pero sí ante una fracción respetable). Este libro expone de una manera bastante gráfica y no tan matemática o abstracta las razones por las cuales no parece que la ciencia pueda explicar el mundo y librarnos de todas sus paradojas. De todas formas para disfrutarlo más es preferible saber algo de física y matemática, pero podemos estar tranquilos de que no va a ser un reto de doctorado. John L. Casti investigates the concept of emergence and how it relates to natural evolution. Emergence is the way complex systems and patterns arise out of a multiplicity of relatively simple interactions. Emergence is central to the theories of integrative levels and of complex systems. Casti defines the main elements of this science including, "the catastrophic and the chaotic." Casti manages to discuss this seemingly confusing and even convoluted topic in a very concise fashion. The accompany John L. Casti investigates the concept of emergence and how it relates to natural evolution. Emergence is the way complex systems and patterns arise out of a multiplicity of relatively simple interactions. Emergence is central to the theories of integrative levels and of complex systems. Casti defines the main elements of this science including, "the catastrophic and the chaotic." Casti manages to discuss this seemingly confusing and even convoluted topic in a very concise fashion. The accompanying diagrams make sense and by the end of his 320-page book you are left feeling like you know much more and a lot less about nature. I found myself asking myself many more questions about how we interpret nature and how we apply it to our daily lives. John L. Casti is one of the founders of "Complexica." "Complexica is an advanced analytics company that designs and builds adaptive intelligent software systems and strategic business simulators. Complexica has extensive experience in the application of advanced data mining techniques to business problems. Much of this experience has been developed in the financial services industry, dealing with problems such as loan acquisition, customer behavior, fraud detection, loss rate prediction, and profitability. In addition, Complexica's business modeling expertise has been applied to strategic problems such as enterprise risk management and organizational design." If you want to know what the real deal with chaos theory is, this is an alright place to start. It opens up the world of complexity theory and shows that there are many more facets than just the butterfly effect. You really have to want it though as the writing is dense and difficult to penetrate. I hated every second of it but I learned a great deal, so it all worked out in the end. This is not an easy read, especially for someone who is not well educated in mathematics. Still, it's not that hard to understand, especially for anyone with some programming experience. But if you aren't interested in odd questions of math, this might not be the book for you. 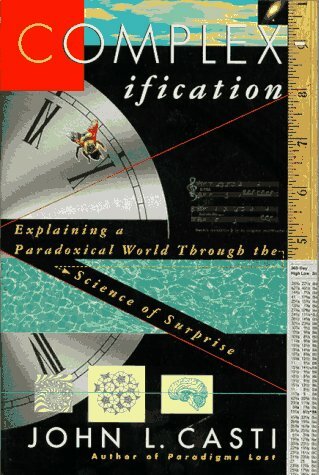 As its subtitle said, 'Explaining a paradoxical world through the science of surprise'. Inspiring and indicative graphs. I need to go through some of the digging deeper material. Carmen says: "The science of complexification as oposed to the science of simplification"
John L. Casti (born 1943) is an author, mathematician, and entrepreneur. As a mathematician and researcher, Casti received his Ph.D. under Richard Bellman at the University of Southern California. He worked at the RAND Corporation in Santa Monica, CA, and served on the faculties of the University of Arizona, New York University and Princeton University, before moving to Vienna in 1973 to become one John L. Casti (born 1943) is an author, mathematician, and entrepreneur. As a mathematician and researcher, Casti received his Ph.D. under Richard Bellman at the University of Southern California. He worked at the RAND Corporation in Santa Monica, CA, and served on the faculties of the University of Arizona, New York University and Princeton University, before moving to Vienna in 1973 to become one of the first members of the research staff at the International Institute for Applied Systems Analysis (IIASA) in Laxenburg, Austria. In 1986, he left IIASA to take up a position as a Professor of Operations Research and System Theory at the Technical University of Vienna. He also served as a member of the External Faculty of the Santa Fe Institute in Santa Fe, New Mexico, USA, from 1992-2002, where he worked extensively on the application of biological metaphors to the mathematical modeling of problems in economics, finance and road-traffic networks, as well as on large-scale computer simulations for the study of such networks. His primary research interests have shifted somewhat in recent years from the natural sciences to the exploration of questions in the social and behavioral realm. One thread has been exploration of the relationship between the social "mood" of a population its biasing effect on actions and behaviors. In this direction, his 2010 book, Mood Matters: From Rising Skirt Lengths to the Collapse of World Powers, published by Copernicus Books, NY, addresses the directions and patterns of social causation and their implications for future trends and collective social events, such as styles in popular culture, the outcome of political processes, and even the rise and fall of civilizations. His most recent book is X-EVENTS: The Collapse of Everything, which addresses the underlying cause of extreme events generated by human inattention, misunderstanding, error, stupidity and/or malevolent intent. The English original edition was published in June 2012 by HarperCollins/Morrow, New York. The book now exists in 15 foreign editions, as well, including German, Japanese, Russian, Dutch, Korean and Portuguese. As an entrepreneur, Casti formed two companies in Santa Fe and London in 2000, Qforma, Inc. and SimWorld, Ltd, respectively, devoted to the employment of tools and concepts from modern system theory for the solution of problems in business and finance, as well as health care. Qforma merged with SkilaMederi in June 2013. In early 2005 he returned to Vienna where he co-founded The Kenos Circle, a professional society that aims to make use of complexity science in order to gain a deeper insight into the future than that offered by more conventional statistical tools. For several years, Professor Casti was a Senior Research Scholar at the International Institute for Applied Systems Analysis in Laxenburg, Austria, where he created an initiative for the study on Extreme Events in Human Society. In January 2012 he left IIASA to form a new research institute in Vienna, The X-Center, devoted to the study of human-caused extreme events. The X-Center has now expanded to a network of affiliated X-Centers in Helsinki, Tokyo, Seoul, New York and Singapore. Since early 2013, Dr. Casti has been serving as a Senior Research Fellow at the Center for Complex Systems and Enterprises at the Stevens Institute of Technology in the USA.